If you floss every day, then great! This writer flosses multiple times per day because she cannot stand having food particles on and/or in between her teeth. Even drinking a simple smoothie can leave specks of blueberry, strawberry or raspberry on your gum line. Nobody should be walking around showing off their perfectly straight pearly whites not realizing that their smile has been compromised by healthy and nutritious fruit! 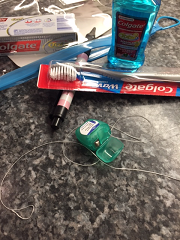 Here is a quick note about flossing that can help you make sure you’re receiving the benefits of this requisite oral hygiene practice. Most people think that sliding the string of floss in between two teeth for a second before moving onto the next area is enough. Well, it’s not. Once the floss is positioned in between two teeth, you must “hug the tooth” so to speak. You are essentially creating a C shape around the tooth on either side of the floss. While the string of floss is wrapped around each tooth, move the string up and down. When flossing, you must move the string of floss up to the area where the tooth and gum meet (the gumline). This is a target zone for bacteria that harbors after eating and drinking. It is also the specific region in your mouth that a toothbrush cannot reach. If you are not hitting the zone below the gumline where the tooth becomes exposed, you are missing more than half of the bacteria that call that region home, sweet home. If you find your gums bleeding while flossing, it might be indicative of a serious problem such as gum disease. Dr. Jessica T. Emery of Chicago’s Sugar Fix Dental Loft can examine your gum health and diagnose possible gum disease. However, it could also be the case when you are not flossing on the regular. Your gums are not used to the friction of the floss rubbing against them. Once you start flossing every day, the bleeding will cease. Healthy gums and daily flossing means no bleeding. If the bleeding does not stop after a few days, call Dr. Emery right away to make an appointment. Better safe than sorry. Gum disease leads to tooth loss. Call Dr. Emery and her team at Sugar Fix Dental Loft today to schedule an initial consultation to examine your state of oral health or one of your biannual routine teeth cleanings. Preventing gum disease is a daily fight that you have to engage in on your own at home. Routine teeth cleanings give you the best flossing experience, but only happen two times a year. Dr. Emery can’t floss your teeth every day (although that would be amazing). It is up to you to be responsible and take action to prevent gum disease. Remember: If you’re not bending, you’re pretending.